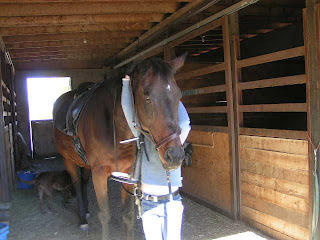 A few months ago I wrote a bit about walking the colic out of our horse, Volare. Well, on this first day of 2009 we walked, and walked and walked and walked....but it just didn't take. The one-eared guy you fuzzily see ever-so-patiently waiting to be prepped for a schooling ride (his specialty along with munching on peppermints) went for his last trailer ride today. Having just crossed into his twenties, and with ongoing health problems, today is not unexpected. Still, this was our favorite, the daily companion of my wife for over fifteen years and a helluva great guy. The year is off to a bit of a rough start. I also see that Coco has a horse late in life post today. Glad to hear things went better over at her place. As for our little ranchette, there's a horse stall missing a 17-hand big guy and his daily gargantuan pre-mealtime piss today. That large daily circle of muck cleaning is just one of 10,000 we'll miss about you, Volare. Happy trails V-Man. Happy trails. Having had this exact experience myself, please accept my condolences to you and your wife. It never goes away, and mine is waiting for me across the great beyond.